Want to add farm fresh milk to your home every day? Then learn which dairy goat breeds are the best fit for you and your family! I really love that I am a homesteader. There is just something so rewarding about a fridge full of eggs, vegetables, fruit, milk, and cheese. If you homestead, then you totally know what I am talking about. Diary is my top pick of goat breeds because they have so many benefits to offer our family. But maybe you are not quite at the milk and cheese point yet? And that just might be why you are here. Adding goats to your homestead is a great way to see if dairy is right for you. Not all families can afford to buy, keep and maintain a dairy cow. Let’s face it, cows are big and can be a bit intimidating. And that is why dairy goats are taking the homesteading market by storm. A smaller animal that requires a lot less room and produces a lot less milk means you do not need to invest a ton of cash up front to create a home for them. Not only that, but you also will not be drowning in milk after just a few days. Dairy goats do give a lot less milk when compared to a cow which is actually the best part of having them. A good dairy goat can produce a gallon a day if not more and that is more than enough for a young growing family. Deciding to get a dairy goat is the easy part. Deciding WHICH dairy goat breed to get is a whole other story. There are a few things to consider when selecting your breed of dairy goat and each one carries it’s own weight of importance. The size of the goat will determine the size of their teats. The larger the teat, I believe, the easier it is to milk them. If the teats are large you can easily use your entire hand to milk which is better if you have arthritis or carpal tunnel. Smaller teats only allow for fingertip milking and that can be painful if you have any issues. Some breeds are calm, some are playful. Some breeds are loud and some are independent. Knowing what fits best in with your family’s age and your location is more important than folks realize. If you live close to your neighbors, then the vocal Nubian might not be a wise choice. If you have very young children, then a small breed such as the Nigerian Dwarf may be a better fit. How much milk do they produce? This one is pretty self-explanatory. If a breed of goat produces up over a gallon of milk a day and you live alone, then this might not be the best pick for you. The same is true for a breed that produces just 1/2 gallon of milk a day and you have 5 young kids at home. Pick the production that best fits your family size. Now, I am not saying you can’t have a small producing goat if your family is large. Just know that you may want more than ONE milking goat if this is the case. It is also important to note that the milk production of each breed is simply the market average and not a guarantee. Milk amounts also depend on good lineage (milk lines), quality feed and minerals, adequate housing, and a good healthy countenance overall. Stressed underfed goats will NOT produce much milk. So please make sure you are consistent with your goat’s care. What is their butterfat content? Butterfat, also known as milk fat, is the fat content that is found in the milk. The amount of butterfat differs depending on the breed of goat. 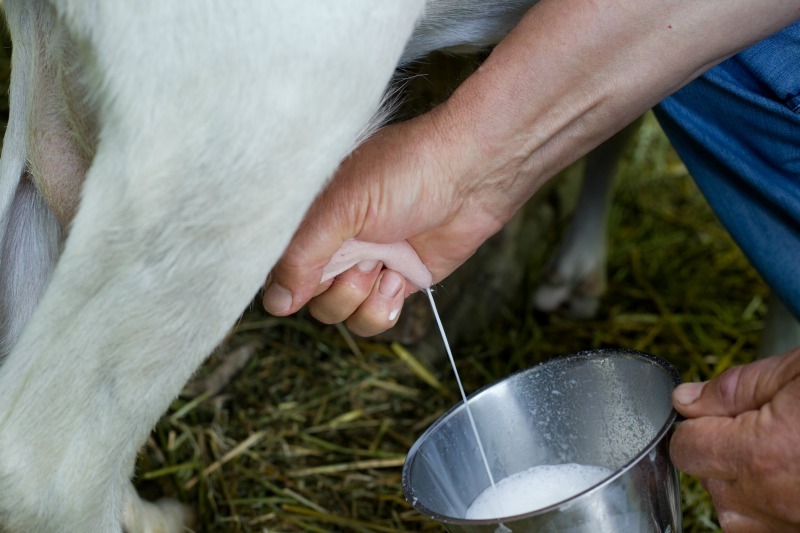 Typically goat milk can contain anywhere from 1%-10% butterfat which is much more than a dairy cow and one of the perks of owning and milking dairy goats. How much butterfat do you want? Well, this all depends on what you plan to do with the milk. If you want to make cheese, then a higher butterfat content is key. The higher the butterfat, the more cheese you will get per gallon of milk. If you want to make soap, then the higher the butterfat the more moisturizing the soap will be. Make a soap with a very high butterfat goat milk and you will find yourself with some of the most moisturizing soaps you have ever tried. Check out this article on Mother Earth New’s that compares farm fresh soaps to store bought. If you plan to drink the milk only, then a lower butterfat might be a better option since it is easier on the waistline. Although, if you have young children then a higher butterfat milk might be your goal as well. Containing key nutrients and vitamins such as A, D, E, and K, high butterfat milk is a great option for young growing children. So, let’s break it all down to make this choice just a bit easier. Widely known for their long pendulous ears, these large dairy goats are by far my favorite and the ones we choose to raise on our own homestead. Since they are larger that means they have larger teats which makes milking a breeze. You can either milk once a day or twice depending on your schedule and milk needs. A wonderful tasting milk with a 4-5% butterfat content giving their milk a lovely sweet flavor. My family loves the taste of Nubian milk and even guests cannot tell a difference between our goat’s milk and cow milk purchased at the store. Even though they are not considered the top producing goat breed, they can still give you well over a gallon a day with some producing close to 2 gallons a day. A bit of a stinker, you will need to work with them just a bit to ensure you do not have any issues on the stand. These are really intelligent goats and just a day of training is usually all you need to get them ready. Nubians are also a more vocal goat and if they are hungry, irritated, in heat, or simply bored they will let you know! Nubians have a hearty 4-5% butterfat content and produce 1-2 gallons a day. A nice large goat that is known as a good steady milker with more consistent averages of 1-2 gallons a day. These goats are medium to large in size and have tall ears. They are great producers and will give you more milk than other goats. With a lower butterfat content of 3.5%, they are more about quantity here. Like the Nubians, they have larger teats which makes milking much easier and quicker too. A docile goat they are a dream on the milk stand or anywhere you want to milk. I have milked these goats tied to a fence and they have done just fine. Alpines have a 3.5% butterfat content and can produce at a steady rate of 1-2 gallons of milk a day. Best known for their tiny ears so much so that they look as if they have none at all, these are a medium sized breed of dairy goat that resembles the build of a Nubian. A very calm and docile goat, they are known for producing lots of butterfat-rich milk. A big perk of the Lamancha Goat is they are long milk producers with some milking up to two years. This is huge especially if you are not fond of breeding every year to keep your goats in milk. Lamancha’s have a 3.9% butterfat content and can produce 1-2 gallons of milk a day. A miniature sized dairy goat and a favorite of young families with small children. These goats are very playful and friendly and because of their smaller size tend to be a better fit if you have young children that are with you at chore time. Nigerian Dwarf goats have smaller teats so they can be tricky to milk if you have big hands or issues such as carpal tunnel. Fingertip milking is usually required to milk but once you get the hang of it, it’s really quite easy to do. Since these goats are smaller their milk production is as well, so more than one doe in milk might be needed to produce enough for a larger family. You will also need a ramp of some sort for the milk stand especially if you have a full sized stand. This is easy to make by attaching boards horizontally to a ramp board that you can securely attach to the base of the stand using hinges. Nigerian’s have a 6. 5% butterfat content with some reaching as high as 10% and produce 1-3 quarts a day. Known for their beautiful coats the Oberhasli is another great family milk goat. They are very friendly and not easily frightened so they do quite well in the milk stand. Another medium-large sized goat they have larger teats for easier milking. They are excellent producers giving up to 2.5 gallons a day. They are great workers and do quite well as a pack goat giving this breed another check in the productivity column. They have a 3.2%butterfatt content and produce an average of 2 gallons a day with some over 3. This large breed goat is the top milk producer on our list today. Producing up to 3 gallons a milk every day, they are a great option for young, growing and large families. This all-white goat has straight ears and short hair that really makes them stand out in a mixed herd. Since this is a large dairy goat, it comes the perk of large teats for easier milking. Even though they are large, they are very docile earning them the name of “Gentle Giant”. They are a favorite large breed for even young families. They have a butterfat content at 3% and produce around 1 – 3 gallons of milk a day. The lower butterfat content allows this milk to resemble the 2% you find in the grocery store. Toggs might be best known for their wattles which are those little appendages on the throat. Although this trait is not exclusive to the Togg, it is more common with this breed. They are a medium sized goat that comes in a variety of colors. They are very calm and do well on the milk stand. A downside to this breed is the actual taste of the milk. Although I have not tasted it myself, I have heard that it can have a bit of a “goaty” flavor. If you are not sure, but just loves this breed I suggest tasting before you buy. Some folks don’t mind the goaty taste while others don’t even notice it. So test it out and see before you invest in this dairy breed. They have a lower butterfat content at 3.2% and produce up over 1 ½ gallon a day. Deciding to add a dairy goat to your farm or homestead is an exciting time. Taking your self-sufficient lifestyle to the next level is the main reason for taking this big step. Yes, you will now be more tied to your home than before. Dairy goats need to be milked every single day on the clock. Consistency is key to good production so keep this in mind before diving in. The perks to owning dairy goats far outweigh the commitment. Fresh milk, delicious varieties of cheese, luxurious soaps and even butter are all things you can now add to your homesteading skills. Grow it, Raise it, Make it….so you do not have to buy, it is the reason we are homesteaders and raising dairy goats will be worth the time and money investment! 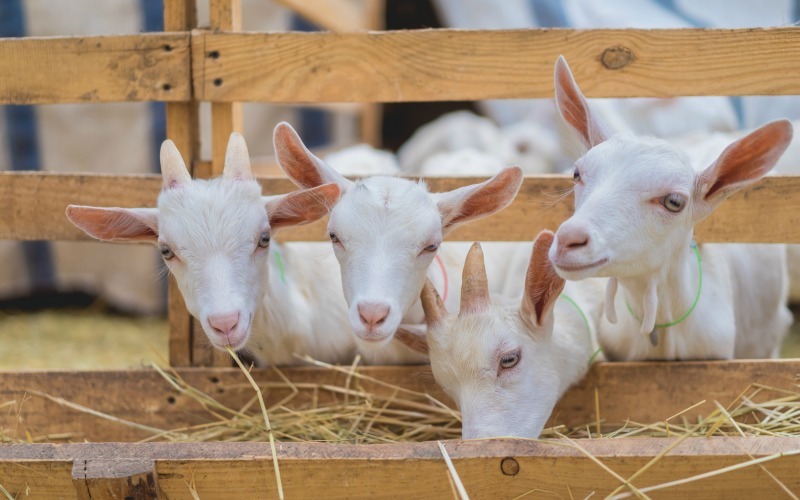 Now that you have read over this list of dairy goat breeds, which one will you choose for your family? Comment below, I would love to hear what you decided! 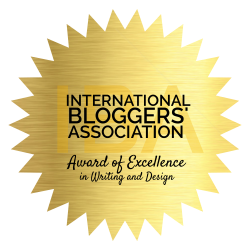 You can find this post and other over at my favorite blog hop! Nice write up on the goat breeds – we have the Nigerians! Thanks for sharing at the Homestead Blog Hop! Oh, I just love Nigerians! Great article on goats!! It brought back all my 4-H memories of raising dairy goats and showing them! We started with goats cause my little sister had really bad eczema as a baby and goat milk was the only thing that cleared it up. Our first goat was a Nubian and quickly we ended up with a small herd. We had Nubians, Saanens, Alpines, and LaManchas. At one point we have over 40 goats. My sister and I would get up early and each milk 4 or 5 goats and then we bottle fed all the babies. It was a lot of work…but I am so grateful for the opportunity to have a small farm growing up. I would love to someday have goats again. In the meantime, I fill my house with all kinds of other critters to love until I can have a place where having goats and other farm animals is possible. Over 40 goats! I can’t even imagine! I bet that was a lot of work…fun but still a lot of work!